WEST LAFAYETTE, Ind.—A new manufacturing technique uses a process similar to newspaper printing to form smoother and more flexible metals for making ultrafast electronic devices. 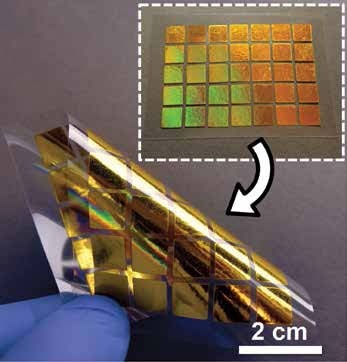 The low-cost process, developed by Purdue University researchers, combines tools already used in industry for manufacturing metals on a large scale, but uses the speed and precision of roll-to-roll newspaper printing to remove a couple of fabrication barriers in making electronics faster than they are today. 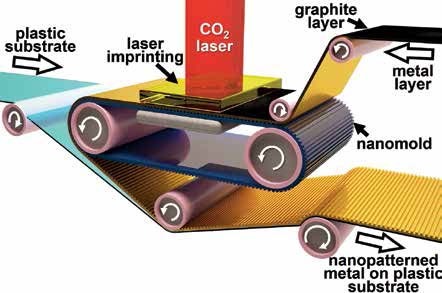 Purdue researchers have addressed both of these issues—roughness and low resolution—with a new large-scale fabrication method that enables the forming of smooth metallic circuits at the nanoscale using conventional carbon dioxide lasers, which are already common for industrial cutting and engraving. The fabrication method, called roll-to-roll laser-induced superplasticity, uses a rolling stamp like those used to print newspapers at high speed. The technique can induce, for a brief period of time, “superelastic” behavior to different metals by applying high-energy laser shots, which enables the metal to flow into the nanoscale features of the rolling stamp, circumventing the formability limit.